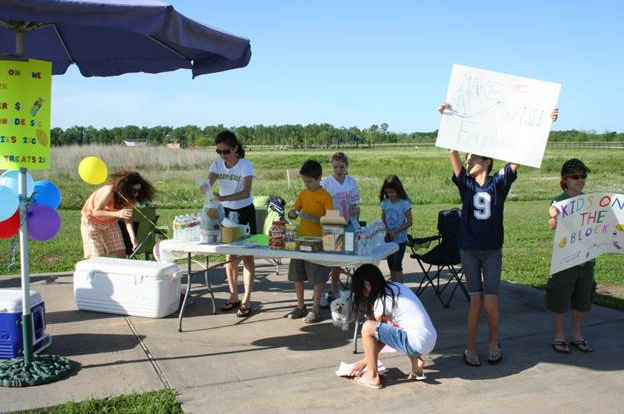 Below, Olga Gisser shares the Lemonade Day experience of budding lemonade tycoons from Sugar Land, Texas. A group of young entrepreneurs took the challenge of starting up a small business as they participated in the National Lemonade Day program! 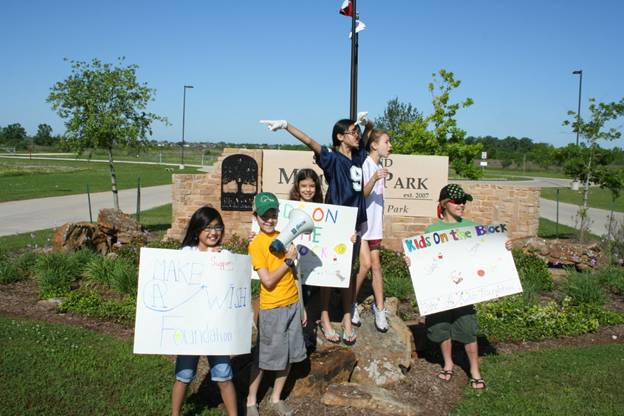 Giselle, Kaela, Leighton, John, Isabelle, and Sophia joined forces to establish Kids on the Block Lemonade. Their goal was to raise $35 to$150, but they ended up surpassing this goal and made $204 in profits, all of which they decided to donate for a good cause! It was quite a business venture. Their elaborate set-up of a table, chairs, umbrella stand along with their sales pitch “Drink Lemonade Fight Cancer” and “Hey, nice car and dog!” got customer’s attention! They offered great tasting cool lemonade, cold bottles of water, a variety of cookies and dog treats. Where will their earnings go? They are so proud to have surpassed their goal and feel great about being able to help others. Part of their proceeds will go toward buying a nice planter for a neighbor battling cancer in hopes of brightening her days. They are sending a check for $206 to the Make a Wish Foundation. They chose this beneficiary because they wanted to help other children battling cancer. Also, this amount is being matched by The Lubrizol Corporation! Would they do this again? You bet! It was a great learning experience for all and even better to have a role in finding a cure for cancer and helping others. Giselle, Kaela, Leighton, John, Isabelle, and Sophia want to thank their many customers and dog friends who stopped by on the corner of University and Commonwealth Blvd. to support their business and special cause. They also want to thank The Lubrizol Corporation for their donation. Entry filed under: Lemonade Day Fun, Lemonade Day Learning. Great job to all of you! I’m proud of you.